Just a few steps from Ponte Vecchio, a place where you can talk about photography, read a magazine or take a look at exhibitions there. It's a true reference point for film or digital lovers, where the lowest common denominator is the passion for photography. A chance to try & test all products: from the iconic M with its legendary lenses, to the S System, passing through the X series up to the most versatile and compact cameras such as the C or the D-Lux. Meanwhile, the Sport Optics product range - truly phenomenal observation tools - will allow you to discover the hidden details of the artistic and cultural heritage of the city that was the cradle of the Renaissance. 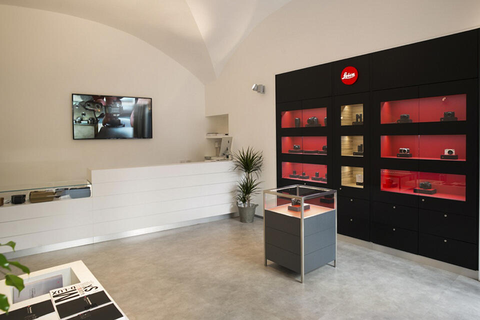 Our staff can guide your choice to best match your needs, and will gladly suggest the most sought-after places for exclusive shots of the main points of interest using the Leica which suits you best. Going down the Arno bank for shooting at "water level": an artificial waterfall can be a good wing for a panoramic photograph. A tripod and a long exposure are in order...The reach Piazzale Michelangelo, an excellent place for a panoramic view of the city seen from above. Our advice is to go there in the evening for fascinating memories of the city by night. You can find in Florence, the venue is neither refined nor sophisticated, as in this place you might even happen to share a table with someone, perhaps with the mayor of the city! Certainly one of the places where you can eat the best natural dishes. No reservations, except for large groups.